what size water tank is on it and is the trial engine that can't pump from open water? If so i'd just like to say which ever person said lets try it can't have ever been on the north yorkshire moors or yorkshire dales. Or do they think they have hydrants all over the county. Added by Tg on 03 August 2009. Tg, this vehicle has a 1000 litre water tank and a 100 litre foam compound tank. It is to go on Trial at Malton as second pump (Retained)with a view to its suitability for perhaps at one of the volunteer stations who are running Land Rovers and are struggling for room to carry kit. It was felt that if sent to a volunteer station for trial its evaluation would take too long. Paul. Added by Paul Warnock on 04 August 2009. Paul, would you be able to tell what size and lenght of hose they have on this truck please. In addition what other equipment they might have. Ladders, suctions hose? Added by David on 04 August 2009. Cheers for the info Paul, does it carry any form or ladders, i'm guessing the Land rovers don't, also will the lack of 4 wheel drive pose any problems ? Great set of pics and be intersting to see how it fairs, hope you are well mate, John . Added by John Johnstone on 04 August 2009. Paul, thanks for this one, interesting it is, but am I alone in being worried by these even being trialled? Added by John Stott on 05 August 2009. John. The Land Rovers do carry a short triple extension ladder as this vehicle does, but no roof ladder. This vehicle can be converted to 4 wheel drive if required. David, this vehicle has a portable Alcon pump, 1 hose reel and 8 lenghts of 45mm delivery hose. 2 BA sets, hydraulic ram, and combi tool spreader/cutters, medical first aid equipment and lots of other bit of kit. Hope this helps. Added by Paul Warnock on 05 August 2009. Thanks Paul. That's helps out quite a bit. Added by David on 05 August 2009. Out of curiousity John, why are you concerned about it being trialled? David it's a van trying to replace a 7.5 tonne 4x4 for starters, can't pump from an open water source, carries only 2 BA sets, it's a cost cutting and life threatening exercise, simple as that . I pay my tax and council tax to North Yorkshire, and if this is what our money goes on to save the brigade money i think it's time us people in North Yorkshire stood up and voiced our worries about these jokes . Added by John Johnstone on 05 August 2009. I would agree that for what this vehicle is intended to do, it doesn't seem to be well though out. a "portable hydrant" for larger fires when the big trucks can't drive down long, narrow driveways. David, thanks for your observations its interesting to compare thinking on rural situations. John is rightly concerned and his views are fairly universal. Many of us in rural areas receive second rate services for most situations in life. I was a rural retained fireman for twenty years and the thought of this kind of machine answering emergency calls instead of a properly equipped and manned machine frankly, appalls me. Trust me David, a van conversion is not the way forward, these are a step back and will cause loss of life and property. I agree fully that a " real " appliance may struggle to get into all locations but these are taking the p--s, as you rightly say, badly thought out design, not upto the job and will be the laughingstock of the fleet. All that concerns me is life, not the price the beadcounters put on it. Cheers David for your insight, and hope you n yours are all well, cheers, John . Added by John Johnstone on 06 August 2009. David, John and John. Take a look at picture #7152 and picture #7158 on this site. This a Mercedes Sprinter van already in use. This vehicle is called a Community Service Vehicle (CSV) the Idea is that these vehicles are crewed by a Community Safety Officer and another (2 crew)and goes out to rural and remote areas carrying out community safety visits, presentations and fitting smoke alarms. They are also sent to Gala's and events to get the safety message over to the community. If an incident should happen in an area were the vehicle is working they are sent to the job as an first strike attendance. The proper full attendance is also mobilised, so if a call comes in for road accident this will go but the full attendance of 2 full size rescue pumps will be mobilised as well. These vehicles carry very limited equipment, such as 2 BA sets, small water tank (not sure of the capacity) high pressure pump (like a pressure cleaner) hydraulic rescue combi tool - spreaders/cutters madical first aid kit and small hand tools. It would attend incidents such as bin, grass, car fires road accidents and known small fires. let me know if you require anymore info. Paul. Added by Paul Warnock on 06 August 2009. Thank you, Paul. It the USA, if it is a EMS call, the mini-pumpers usually go out by themselves, followed up by an ambulance, also with paramedics. Anything else, a pump water tender or more (depending on the type of call) responds as well. Cheers to you both of you, John, and John. I understand your concerns about the Renault. Yes, something of that size is not, by itself, equipped to handle rural incidents. I hope your fire district understands that. On a side note, in the USA, the Renault would not be counted as an engine due to its small water tank. It would be considered a "service truck" and its points added to an engine or quint. Added by David on 06 August 2009. Added by David Lampp on 06 August 2009. Thanks David, North Yorkshire is a vast moorland area with mainly small towns and villages a long way apart. Most stations have a decent pump with full gear and this is why developments like this worry many of us. Added by John Stott on 07 August 2009. In the US, many rural fire departments run pump water tenders that can operate more as water carriers, while still equipped with all the equipment your pump tenders have. These trucks may run first out on a shout and usually carry anywhere from 6000 l. to 12000 l. water tanks. They arrive first, attack the fire, and the trucks that respond after it, either lay hose, or shuttle water to support it. When I go on Youtube, or go to individual websites, I have noticed almost all the first responding rural pump water tenders have 1800 l. tanks or smaller (Highland and Isles notably). So, out of curiousity, and I realize firefighting in the UK is different than the US, why is that? From what John S. has described, seems to me that running a pump water carrier and a pump water tender after would make a certain amount of sense. Added by David on 07 August 2009.
the trouble with this country david is that money comes before life. as you are aware on this site alot of people are all for dennis or bedford fire engines because these have stood the test of time. they have stood by many a hour pumping water at shouts or just giving good service.Its all bout money saving now and it don't matter what happens as long as they have saved a few quid. most of the people on this site are or was firefighters who know what is best and works well. But the trouble is people get fast tracked into these jobs who haven't got a clue what or how the job goes. Thers a old sayin "if it ain't broke don't fix it" and this is what people on this site are saying. If a big WRL has been on a rual station for so many years and served well why stick a van in its place. To me its a insult to the crew. Lets design our own PRL,CARP,WRL,WRT,ET and whatever else on this web site and show these so called big wigs what this country needs. Added by Tg on 07 August 2009. It is no different here. The city of Atlanta currently runs 3 firefighters on most of their Wrts, HPs, and TLs. They disbanded the Hazardous Material unit. It is not uncommon to occasionally see 2 firefithers on the WrTs and HPs in the county I live in. Added by David Lampp on 08 August 2009. Thanks Tg, sums it up in a nut shell that does! Dave, no offence taken mate, as others say till they are blue in the face, we operated a good system with purpose made machines, good crews who didn't do it for money but a sense of community. The people who make decisions now don't have these values, hence the sad collection of commercial vehicles we see posing as fire engines. We wont shutup though, and can I say, that time and time again we are being proved right. Added by John Stott on 08 August 2009.
hi all just been reading your comments about the new "fire van!!" i am currently retained at the station and will be manning/trialing the "van" for three months replacing a 4x4 we have had for 15 yrs willl let you all know how it is going as/when we get trained up and its put on the run. Added by Me on 10 August 2009. Added by Paul Warnock on 10 August 2009. Thanks Me, a few of us will await with a lot of interest! Added by John Stott on 10 August 2009. Putting the Anglo-American context aside... Let me bring in some commentary on this invention from the perspective of its country of origin. As you all know, this Mascott has a GRP bodywork by a Polish company called ISS Wawrzaszek. This type of vehicle can be found at almost every full-time State Fire Service station across Poland. I am astounded to see that somebody wants to use it as a pump/L4P replacement in England. It was designed to play a completely different role in the fire service, in a country that has a unique fire&rescue system. Here's some history: before 1989, fire cover in Poland was provided by a peculiar mix of municipal, communal and works fire services (professional as well as volunteer), under the supervision of 49 Regional and one Central Command of Fire Services. They often lacked equipment that would have enabled them to respond to incidents other than fires. Firefighters attending car accidents in rural areas were equipped with nothing more than crowbars, axes and wire cutters for extraction of victims. This changed in 1992, when the State Fire Service (PSP) was established, which took over most of the existing professional units. From 1992/1993, every station was equipped with proper rescue equipment. The standard Lukas/Holmatro set, along with portable lightning equipment, lifting bags, etc. would not fit in the lockers of existing appliances, designed solely for fire-fighting, so a fleet of vans (a vast majority of them being VW Transporters T4, with a standard cab for a crew of 3) was purchased to solve this problem (they had no water onboard though, just fire extinguishers). Around 2001/2002, a new generation of what was called 'SLRt' ('light specialist technical rescue appliance') was introduced. The new breed of the SLRt had a double cab (5-6 seats), a 1000l water/100l foam tank, a HP only pump (100-250 lpm @40 bar) and a hosereel. The new concept allowed the SFS to respond to most accidents with a single vehicle, which carried the appropriate equipment, had a considerable firefighting capacity and could carry a large crew if needed. Apart from a SLRt, a vast majority of stations also run at least one standard pump (2,5 m3 of water) and a pump/tanker (5-8 m3 of water). In practice, the SLRt is usually accompanied by one of these, just in case. This is the long and the short of it: vehicles like the Mascott above were designed to serve as a light rapid intervention rescue appliance that would not go off-road. Some of these are used as 'first away' pumps in cities with narrow streets in old towns, such as Lublin, or Gdansk, but this is it. Hope this will help you understand why this particular vehicle looks like that. And the decision to use it as a 'rural pump' is incomprehensible to me. This is the last thing it was designed for. Added by Konrad Nowak on 10 August 2009. Thankyou Konrad, in fairness Paul described its intended use. The real reason will be cost and regardless of what publicity is put out by North Yorkshire, most people will know the true reason. The Landrovers need replacement, but the replacements that will suffice are expensive. However there are suitable chassis to replace them that will carry more gear ie Unimogs and Toyota to name two candidates. The type of country these machines need to operate in will wreck them within months, they need to be robust and purpose built for a rural area. I personally dont have a problem with a "first strike" concept for cities and towns, I just think the brigade has shot itself in the foot with this. Added by John Stott on 11 August 2009. Thanks, Konrad, for "filling us in" on this Fire-Truck. Now, has anyone got photos of this Fire-Truck, in it's proper job eg, in the city, and in the "old-town" part ?! Added by Pat Rivers-Bowerman on 15 August 2009. Well I thought I'd just add a little something to this ever growing documentary on what might appear to be a great little(fire appliance)unit.I'm certainly waiting for the feed back if and when it finally goes on the run. Having travelled in recent years to Austria(3),Germany(1),Belguim(1),Switzerland(1),France(1),Poland(1),Czeck Republic(1),and Luxembourg now twice,these type of fire appliances are widely used,generally though as a back-up pumping unit to the standard pumping appliance.They carry extra equipment to an incident,plus extra personnel mainly due to often isolated locations such as small villages and towns,but one thing I did notice is that even the smallest of village has its own volunteer fire station/brigade,and always a standard fire unit. Many small village/town brigades use these size appliances as rapid intervention units(rescue)and its not unusual although many of these outlets are shut off during the winter months to find various types of appliances,many having been purchased through funds raised from the local community and this is typical of the type of appliance obtained as a 2nd pump,or put into some other use,ie-rescue unit in these smaller rural isolated communities,many being completely shut off and therefore unable to get help and support from outside their local community. 1st line major pump-I don't think so but we'll have to wait and see,I've now added my piece and now I await the trials and even more comments.I'm really getting excited now,I just can't wait to see if this thing gets bogged down on the moors in winter in that snow and what will come and pull it out-a major pumping appliance maybe?????. Added by Pete Matten on 15 August 2009. Pete they will possibly use the 4x4 7.5 tonne Merc it's replacing to drag it out if it does happen and we see the pics oh how will i laugh at that ! Added by John Johnstone on 15 August 2009. Pete, as ever I read your comments with interest and I agree as a first strike, this kind of machine can have a role. Having had, like many ex and current firefighting contributors to this site, the experience of island and rural situations I can state the obvious. In an area like The North York Moors, this design is a none starter, no pun intended. Four wheel drive, ground clearance and elevated exhaust are the first consideration, this has none. Lack of a suction eye, delivery hose, even chimney gear? No sorry, it doesnt wash. There are Steyrs and Unimogs more suited to this role and even the humble Landy is still in there. This would fit in York, in The Shambles as a first attendance only. Or as Konrad and you say a back up to a proper pump. When I was with West Yorks, we would have wrecked this within a month, too many farm tracks do wonders to a well built Dennis and they are of proper construction and purpose built. As you say, lets wait for the trials and results. On a political note, it will be interesting to see the councils comments to say the least! Added by John Stott on 15 August 2009. I hope the Council add there comments on here but its very unlikely they'll do that,but if you find next year your rates go up yet again,you'll be sure to know where some of your money's going-yet another new machine.But I wonder what they'll decide on next,I say-I wonder what ever next?. Pete, its interesting to say the least but councils manage to hide figures remarkably well. Requests for figures under Freedom of Information meet a stone wall of spin and gobbldegook that put central government to shame! One way I find round this is to ask manufacturers directly for unit costs and total it up. This machine would seem to pan out at £25000. A Steyr or Unimog, properly kitted, nearer £100,000. They would deny this of course. Its blatant penny pinching, nothing else. Added by John Stott on 16 August 2009. Just to keep you all informed on this vehicle ( i can't call it a fire engine ) it is off the run ! Added by John Johnstone on 21 September 2009. I am curious, what ever happened with this appliance after the trial run? Was it successful or not? Added by David L on 26 July 2010. Hi David. North Yorkshire did not purchase this vehicle after the trial, it went back to Emergency One. I heard recently that it has been sold to an unknown Brigade for their cadet scheme. Hope this helps. Added by Paul Warnock on 26 July 2010. Added by David L on 27 July 2010. 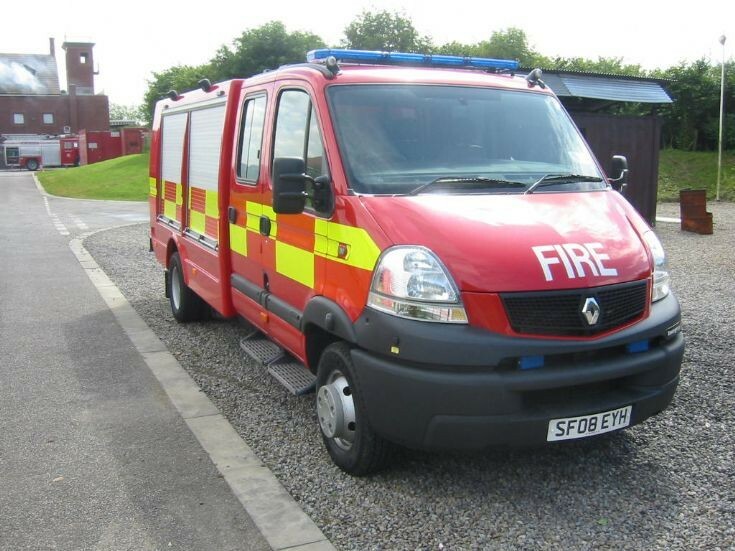 I believe Staffordshire have bought this for YFF & CFS duties and should be heading for Stone. Added by Adam on 27 July 2010. Thank god North Yorks Fire & Rescue decided to shelve this idea....from what I've seen they are a bloody good Brigade with decent equipment. Long may this last! Added by James on 11 February 2011. Hi well, the way I see it is we should just have fire engines made for the job and that's that lot easier, plan and simple.They have the room for ladders and equipment and for doing the job. Added by Mark Whiteley on 13 February 2011. The Polish - style light rescue and first aid firefighter crops up in various versions in other European countries as a first (or sole) responder to minor alarms, such as RTAs, AFAs, EMS calls and non-structure fires, with a crew of two or three. But the thinking behind this is to avoid sending a full-size pump rescue with a crew of 5 or 6 to a minor incident. This way, a typical full-time city two pump station with a TL and 12-14 firefighters on watch will still have 9-12 personnel and all three primary appliances available, after the minor alarm response truck is dispatched. In many cities, minor alarms account for 80% or more of calls. If each one is treated as a serious incident, with a full response, fire cover can get depleted very fast. But this type of unit makes no sense at all at a retained station. There is usually limited room, so it often displaces a full size truck. The issue is not coverage, because simultaneous or overlapping calls at on-call stations are rare. In addition, enough firefighters will respond to man one or two full-size pumpers, so why limit the vehicles' seating to transport fewer people? By the way, if the North Yorkshire service is looking for more space on their Land-Rovers, why not take a look at the 6X4 conversion, with the longer rear body? Added by Rob Johnson on 01 August 2012. Added by Konrad Nowak on 06 August 2012.